News came down yesterday that highly-touted Twins SS prospect Wander Javier will undergo season-ending surgery on his left (non-throwing) shoulder to repair a torn labrum. According to LEN, this was an injury that was suffered initially late last season, but initially the decision was made to attempt to treat Javier with rehabilitation. Unfortunately, he has continued to have pain in the shoulder, and he has taken the dreaded trip to Pensacola, FL to see Dr. James Andrews. It sounds like Dr. Andrews will perform surgery soon, and that Javier is expected to be out six to nine months. Shoulder injuries are common in baseball players, certainly. But they are much more common in the throwing shoulder, particularly in pitchers. Let’s discuss how this injury may be similar and different. Question 1: What is a labrum, anyway? The shoulder is considered a ball-and-socket joint. The round ball (humeral head) sits in the socket (glenoid) similar to how a golf ball sits on a golf tee. Around the perimeter of the golf tee is a strong cartilage tissue called a labrum. The labrum surrounds the socket similar to the red gasket on a mason jar lid. Its function is to help act as a ‘bumper’ to hold the golf ball on the golf tee. It is also an attachment point for ligaments around the shoulder that also contribute to shoulder stability. Question 2: How does a labrum get injured? There are several ways that someone could injure the labrum of the shoulder. In baseball players (and pitchers in particular), it is common for a labrum tear to occur at the top of the socket near the attachment of the biceps tendon. This is called a SLAP tear (Superior Labrum Anterior to Posterior) and is typically the cumulative result of repetitive use. However, it can also occur as a result of a dive/fall if the mechanism is just right. Another way the labrum can be injured is as a result of a shoulder dislocation. In the majority of cases, the ball dislocates out the front (anterior) of the socket, and the attachment of the labrum to the rim of the socket is damaged. A final way that I have seen labrum injuries in baseball players is in the front shoulder of hitters. Occasionally, as a result of an aggressive swing (or combination of swings) a player can damage the labrum in the back part (posterior) of the shoulder. This is also an injury that I sometimes see in golfers. In Javier’s case, the injury is to his left shoulder. As he is a right-handed hitter, this would be his front shoulder. I was not able to find any reports of him dislocating his shoulder last season (which would suggest an anterior labral tear). It is possible, then, that his labral tear is more in the back of the socket (though this is purely speculation on my part). Question 3: Why didn’t he just have surgery in the off-season to get this taken care of? This is always a difficult question to answer without knowing specifics of the situation. Hindsight is 20/20, but it is not always known at the time of an initial injury whether it is going to require surgery or whether rehab will be sufficient. Clearly, the Twins and Javier felt that rehab stood a reasonable chance of being successful, or I suspect surgery would have been undertaken previously. Question 4: What is done at surgery? There are subtle variations in technique for these type of injuries, but the majority are treated with arthroscopic surgery. This means a small fiber-optic camera is inserted into the shoulder, and the shoulder is filled with fluid. 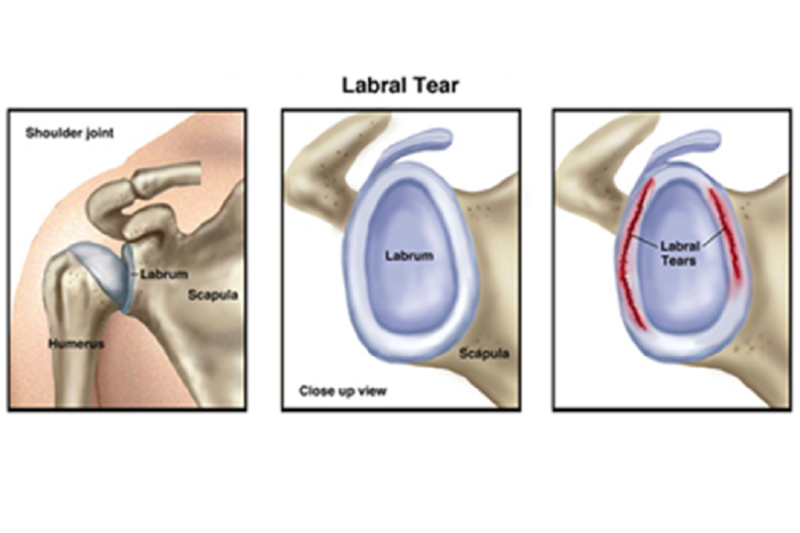 The labrum is then examined and the extent of the tear is assessed. Typically, the pre-op MRI will give the surgeon a good idea how extensive the tear is, but the precise size and location of the tear is not known until surgery. Once the tear has been assessed, the repair process begins. Small anchors (similar to plastic drywall screws) are inserted into the rim of the socket in the area of the labrum damage. These vary in size, but are typically somewhere around 3.0mm in diameter. These anchors have strong stitches attached. The stitches are passed around the labrum using special tools and the labrum is secured back to the rim of the socket. This process is repeated for as many anchors as are needed to completely repair the tear. After surgery, the small incisions are closed with suture and the patient heads to the recovery room. Surgery typically takes around 1-1.5 hours. Question 5: What happens after surgery? Why does it take so long to get back to full activity? Any time we repair a structure in orthopedics, the rate of healing is dependent on a number of factors. Some factors include the type of tissue injured, the severity of the injury, the age and health of the patient as well as numerous others. One helpful comparison in this case can be a fracture of a bone. Bone, as compared to cartilage (labrum) has a much greater blood supply. As such, most bone fractures are able to fully heal somewhere around 6-10 weeks (with some variability of course). A labrum (as with all cartilage) has a much poorer blood supply, and as a result takes a lot longer to heal. This is one of the main reasons for the lengthy rehab. In addition, the stresses placed on the shoulder are significant. The labrum has to withstand a tremendous amount of force when throwing a baseball or swinging a bat. The muscles around the shoulder tend to get weak quickly after surgery, and it takes time to rebuild the muscles. Proceeding too aggressively (before the muscles have recovered) places extra stress on the labrum, and can lead to failure of the repair to fully heal. Question 6: Will Javier’s shoulder ever be the same? This is perhaps the most difficult question to answer. Without knowing the extent and location of the damage, it is very difficult to comment on this subject. It is certainly better that this is his non-throwing shoulder, as that likely portends a better chance of full recovery. Few surgeons have done more of this type of surgery than Dr. Andrews, so he is in good hands. Excellent explanation! It's been decades since my Human Anatomy, Kinesiology and Sports Injuries classes and right now I'm wishing you had been one of my instructors. Fascinating info about this surgery! Do you work in a medical field that you are so knowledgeable about it? The only plus with this injury is that it puts him in the pipeline behind Royce Lewis. The downside, it adds a year to his baseball life and the Twins will have to protect him when he is still in A+ ball. As someone who has had both shoulders totally replaced, I can testify to the length and difficulty of the recovery process. I'm four and a half months into my recovery from the most recent surgery. Yesterday, I tried to throw a small pine cone into the woods and came up screaming. Still a long way to go. Another great lesson Heezy, thanks for sharing your expertise! Labrum surgery is tricky and outcomes more unpredictable than other sports injuries (except 'thoracic outlet surgery'). Joint can end up too tight or too loose. If it was the throwing shoulder I'd be VERY worried but alas, it is not, so he's got a shot. Thanks! I am an orthopedic surgeon who specializes in sports medicine. I also was able to spend a year training with Dr. Andrews in Pensacola, so I have some insight into what goes on during these type of situations from my experience there as well. Thanks for the compliment! I don't have a lot of experience writing blog posts such as this, so I welcome feedback about how I can be better. Last September I dislocated my shoulder and ended up with a couple labral tears and a fractured glenoid rim. I had to have the glenoid fracture duct taped back into place. Needless to say, my prospect status has fallen quickly. I'm finally just able to work on strengthening it back up now. I tried to throw a ball far for my dog to fetch over the weekend and instant regret set in. Thanks for sharing your expertise here. An unfortunate event but an excellent article. Thank you for your expertise! I think Heezy did mention why. He shouldn't have had to mention why. This isn't a video game, Javier is a living breathing actual human being facing a less than certain surgery that has a 9 month recovery time and he will be physically incapacitated for a long length of time. If an 18-year-old wants to see if rest and recovery will work first, it's his right, and it was probably the best decision for him. Absolutely. His body, his decision. But you are also speculating. We don't know whose recommendation rest and rehab was. It never seems to work, IMO. For all we know, he was fully willing to get the surgery out of the way, and the team and/or doctors convinced him he didn't need it. Fair point. But I would say, in my experience at least, this is almost never the case. We typically try to give our best evaluation of the likelihood of success with both surgical and non-surgical treatment (and now sometimes including consideration of PRP and/or stem cell treatment). It is typically up to the player to decide which route they would like to take. Certainly in some cases, suggestions may be made from team/agent/family etc, but I have not experienced a case where a surgeon or team 'convinced' anyone they didn't need surgery. Doesn't mean it doesn't ever happen, but my thought would be it is quite unlikely. There are cases where the reverse is true, I would say- that sometimes an athlete thinks they can overcome an injury without surgery and a surgeon's experience tells them it's going to be very difficult. In which case I have had to strongly recommend surgery to certain patients. But, even then, it is their choice. All we can do is provide the best information we can to let them make the best choice for themselves. This is the injury that knocked Radke out the final time in 2006 and ended Glen Perkins career for all intensive purposes.Very very painful and difficult recovery especially if your a pitcher. Fantastic post Heezy! I feel so much smarter for having read this!